Folklife and traditional arts in some form are common to all persons, no matter when or where they live. These cultural traditions are important in our lives, because they profoundly affect how we view our world and how we interact with others. The unit is named Nebraska by Heart because most of the learning of folk traditions is based on observation, memory, and imitation. It doesn't come from books or other formal learning situations. Also folk traditions are mostly passed on to us by our friends, relatives and other loved ones. They are thus both learned and perpetuated "by heart." In the unit, students will respond to both historic and contemporary examples of folk arts and folklife from many different Nebraska cultures and subcultures. They will examine and react to examples of folk arts and folklife from their own backgrounds and from the experiences of others in their communities. They also will learn how to create or participate in examples of folk arts from various Nebraska cultural groups. The unit focuses specifically on traditional arts and folklife from cultural groups present in Nebraska today. However, when useful for illustrating a particular artistic tradition or its history, some information and examples may be drawn from communities representing the same cultures located elsewhere in the United States or the world. Two of the greatest strengths of this unit are its experiential nature and the way it encourages students to think for themselves in investigating traditional arts, folklife and culture. Another strength is the inherent interdisciplinary nature of folklife and folk arts themselves. 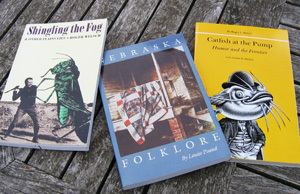 Folklore and folklife are grounded in both the arts and humanities. In addition, concepts from science, math and social studies are useful in studying the different genres of these traditional practices and the social contexts in which they occur. Nebraska By Heart contains three lessons, plus a concluding integration and assessment component. Each lesson includes several activities and has suggestions for extensions. The assessment component is designed to integrate and evaluate the unit. Each activity has estimated time requirements, but the total number of class periods required to complete the unit will depend upon class scheduling, the number of folklife genres chosen for study, and the judgment of the teacher. offers the most profound philosophical statements over morning coffee. the teachers who helped in unit development and testing. the middle school students who participated in the classroom testing phase of the project. Students will recognize and value the connections between folklife, folk and traditional arts and their own lives and environments. Students will recognize and investigate the many roles of folk and traditional arts and artists in the past, present and future of Nebraska. Students will understand connections between folk and traditional arts and other fields of study, such as literature, architecture and science. Students will recognize the importance of diversity and equity in the creation, performance, interpretation and evaluation of folk and traditional arts, and the arts in general. 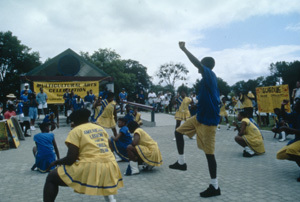 In the opening lesson, students learn a few common definitions of folklife and folk arts, identify several folk groups to which they belong, learn about some of the many genres of folk art, and play a game or fill out a questionnaire that helps them identify examples of folklife and folk and traditional arts from their own families, friendship groups and communities. The optional extension of this lesson provides instruction and information for teachers about how to plan a field experience for students and how to prepare them to participate in that experience. To complete the fieldwork, students will conduct an interview with a knowledgeable family member, friend or community resident about a particular aspect of folklife or a traditional art. Each of the five genre groupings is introduced with examples of the art forms/traditions in that group from a variety of Nebraska cultures. In each of the genres teachers choose for study, opportunities are suggested and resource information is provided to help students experience one of the included art forms through closer investigation. Students can investigate art forms through games, hands-on arts activities, or by interacting with traditional artists or local tradition bearers (people with extensive knowledge of a tradition). A suggested extension of the lesson involves learning about and sharing a traditional recipe. The lesson also introduces important concepts, such as context and emerging traditions. The conclusion of the unit places the information learned firmly into the present day by helping students reflect on the importance of these traditions in their own daily lives and the lives of their contemporaries. 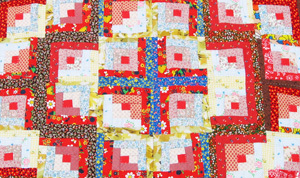 Students also examine connections between the many varied examples of Nebraska folk arts by looking at things those examples have in common. These commonalties occur inevitably, because of our shared natural environment, the prevalence of agriculture in our state, and other effects of the place we live. Finally, students are asked to use high-level thinking skills to interpret an article about a folklife tradition from a newspaper, magazine article or other resource, and to make inferences about its importance to the people in the article and/or to society.